While it's no big secret that today's new car buyers do their fair share of research over the Internet when considering different vehicles, there is a growing trend that's changing how they find the car that's right for them. More and more, new car shoppers are doing their own searches through a dealer's inventory. Not only are they visiting manufacturer web sites and third party ones that offer vehicle info and specs on models for all available makes (like NewCars.com and Cars.com), but new car buyers are increasingly using tools and features that allow them to look at what's actually on the lots of local dealerships. According to recent studies by J.D. Power and Associates, 33.5% of today's buyers use a Search Inventory feature on a third-party web site, more than any other shopping tool in the 6 months prior to purchasing a new car. In comparison, new car shoppers are still requesting Internet price quotes (22.3%). However, this option gives the dealer a chance to sell an available car they want to sell which may meet some, but not all, of a buyer's specifications. New vehicle inventory search tools allow shoppers to pinpoint the exact car with everything they want in it and where it's located. And the best way of doing that is by using the New Car Locator from NewCars.com. Locate new cars that match their specifications, without leaving the comfort of home. Buyers can search for what they really want in terms of trims, exterior colors, transmissions, engines, and drivetrains. Look through new car dealer inventory from different manufacturers. And from a tool that's updated daily! So shoppers can look at actual Honda CR-Vs and Toyota RAV4s, all from one place. That's something you can't do on just one manufacturer or dealer web site. Review inventory results from a clear and easy-to-scan list to find the exact car they want, or from a fun and interactive map if they want to find a matching car that's closest to them. Contact multiple dealers for matching cars. New vehicle shoppers can tell the Internet Sales Manager what car they want and know that it's on their lot right now. No reason to settle on other vehicle possibilities; buyers can go straight to negotiating the best price. So don't wait another second to find where your new car is waiting for you! 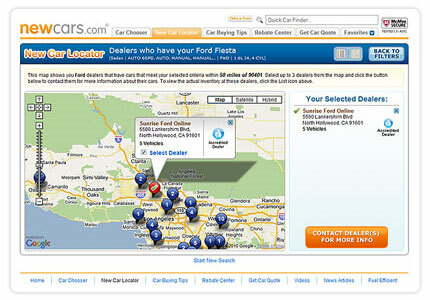 Try the New Car Locator from NewCars.com today and locate your next new car, exactly as you want it.